For this Term of Constellation we had to choose between 8 options, I chose to do Cath Davies option “Smells Like Teen Spirit”, due to the fact that last term, I found her constellation session to be by far the most engaging, and helpful towards constellation in general. She instructed us in her own method of analysing images and using academic text in essays, and i found her way of teaching to be really understandable and helpful, on a level which only one or two of the other lecturers sessions compared to. I found her to be the best tutor for me personally to learn from, apart from which, I also found her sessions to be based around fascinating and interesting topics, and her way of thinking inspires me to look at mine and other peoples artwork in a different light, how every decision you make, tells a narrative. In Caths first session, after giving us a basic description of what would be covered during this module, such as analysing different subculture styles such as goth, punk, the teddy boys, hip hop ect, and how they’re outfits and clothing choices make a statement, and she would teach us how to unpick all the individual pieces to create a wider statement about various issues such as race, class, politics and many more. During the lecture we looked at “Identity expression within visual and material culture”, and how gender, race, ethnicity, class, sexuality, youth identity and anti -establishment values are being expressed visually through fashion and body manipulation. We also started to think how subcultures recycle style and material objects and generate new meanings through the change in use, or by the people who have adopted the object or clothing into their subculture (“Recycling the past”). 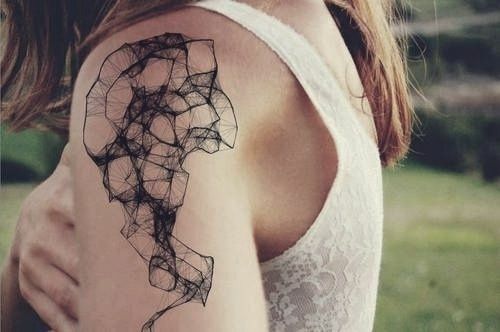 These images of a modern tattoo design, meant to be visually appealing and literal body art, rather than a statement. 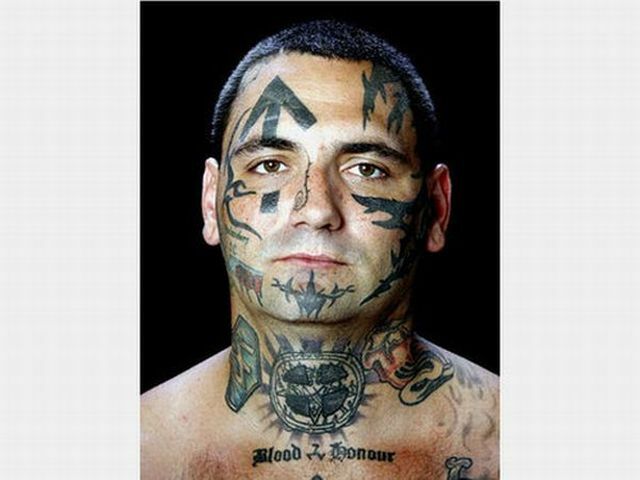 A image of a previous ‘Skin Head’ and his facial tattoos, which lots of skin heads had done to show the skin head subculture identity. During this constellation essay, we also looked at the Madonnas Iconic corset outfit from her ‘Blonde Ambition’ tour, made by Jean Paul Gaultier, for Madonna, which he teamed with a masculine two piece pinstripe suit in order to alter the conations of the different items in the ensemble. The trouser suit is associated with success/power of businessmen, where as the corset is pink, made of silk, but is worn as outerwear(layered over her trousers), which tends to suggest powerful women, which Madonna is renowned for. As well as this, the Corset was made with a huge difference compared to a normal corset, the cone shaped breasts, which are their to make a statement, the element of that makes the outfit unforgettable, which also amplifies the powerful, in your face, boss like image, enhanced by threatening appearance of the spiky cones, rather than the traditional image of breasts being soft, girly and comforting for men. Gaultier appears to have taken reference in his designs from the Victorian style corset, when women were controlled by the men of the time, and where women were seen as a thing of beauty, rather than equals. He did this by using similar materials and design, but he’s adapted the style to give it a new conation by adding the cone breasts, and the belt, and things that suggest power. As an artist I believe this is a brilliant way of making a statement with your work. by using things that once had a very traditional/set conation and then changing it to create an entirely different meaning, is genius. I will aim to do this, so that I don’t just conform to the rules so that I don’t upset people, because if you do that you can’t make a difference to the issues that matter. Jean Paul Gaultier helped Madonna make a statement in her blonde ambition tour, which ultimately people will remember for generations as a turning point, and I think as an artist this is something we have the power to do if we make an effort and are passionate. During this constellation session Cath talked about the importance of ‘theoretical underpinning’ in any analysis. She was referencing to any essays we were to do in the future where we are analysing images, or any topic. The type of theoretical underpinning we’d use would be dependent on what point we’re trying to support, for example to avoid making sweeping statements we’d use academic sources to find someone else who’s made a similar point, or we’d find research we’re they’ve argued against our point and we’d make arguments why we disagree and find other academics that support that. Cath thought us to use ‘Cath Columns’ to ensure we have academic theory to support every statement we make based on our analysis. Having learnt this I realise that perhaps ‘The Baby Cage’ essay I did didn’t have enough/the write academic underpinning, for example I could have found a piece of academic theory about how the composition of an image can change the perception of the image.